Takes about 12 hours, sliced about 3/8″ thick and then cut each slice into probably 4 pieces. That’s with my Nesco 400 watt dehydrator, with good heat and a fan, but it’s not temp adjustable. 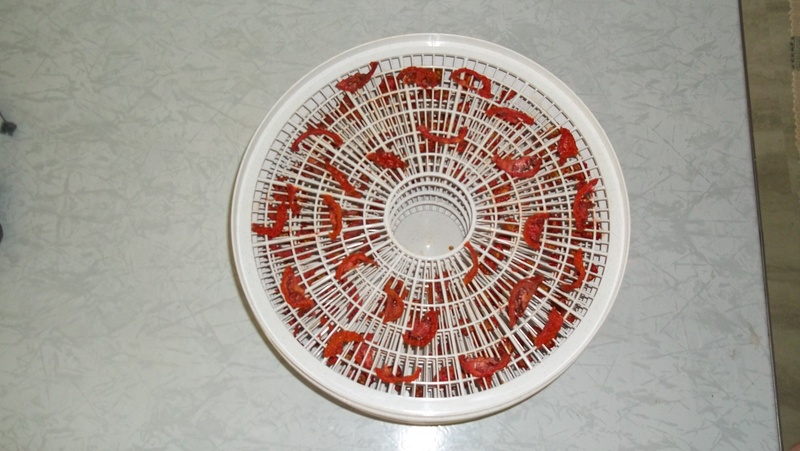 But it sure does the job of dehydrating things to put by for winter meals! To eat good things when it’s 15 degrees and snowing, and think, wow, that grew right out there…………….yessss. They’re very sweet and good to eat plain when they’re dehydrated, so I need to make sure I don’t treat them like picking strawberries when I take them off the dehydrator. Sometimes when you pick strawberries it’s 3 for the bucket, 1 for the mouth, lol. I don’t do fruit (yet, lol) but the veggies are great and easy to make good stuff in the winter. And I actually enjoy the process. Good luck with yours! Why aren’t you a Master Gardener ? Cos I’m not as good as you are, Mary! I see all your flowers you grow, and they’re all wonderful. There’s a good idea you had. Will you give it a go? The colour is so intense after the tomatoes have been dried. It is. Did you ever dehydrate any? They keep some of their meatiness about them after you rehydrate them. I like this much better than freezing them.